Oftentimes, stress and work pressure are unavoidable in our everyday lives. While a little stress here and there can be motivated, chronic stress and constant pressure can be dangerous. Because of that, it is useful to find strategies that work for each of us and lessen the pressure. 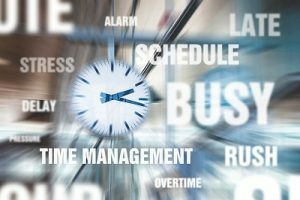 One of the strategies is developing time management skills. For example, when we have to finish a big project, it is highly useful to split it into smaller tasks and make a schedule for each of them. It will shift our focus to practical steps and help us move from one task to another easier. Another strategy can be applied when we have a deadline. Experts recommend focusing on a task ahead not thinking about its deadline. If necessary, they advise setting up a virtual deadline that helps us finish our task before the real one. The goal is to make a buffer to decrease tension and make additional time to polish our work. According to experts, good organizational skills also help at making priorities. Setting priorities enable us to finish important tasks first, not allowing unnecessary work interfering with what is really important. To learn more about the coping skills to work under pressure, the article “13 Secrets to Performing Well Under Pressure” gives us the following list. 1. Think of high-pressure moments as a (fun) challenge, not a life-or-death threat. 2. Remind yourself that this is just one of many opportunities. 3. Focus on the task, not the outcome. 4. Let yourself plan for the worst. 6. Flash back to your past successes. 7. Be positive before and during high-pressure moments. 8. Get in touch with your senses. 9. Listen to music — or make some. 10. Create a pre-performance routine. Among the coping skills to work under pressure, we can work on negative emotions that add more pressure to stress. Frequently, it is not a deadline or heavy task that puts us on the pressure. It is rather our negative thinking. For example, if we tend to worry excessively whether we will finish the task before assigned deadline, or make a difficult project done, the pressure is self-made. In that case, meditation techniques can work the best. Their benefits are not only calm us down, but also to make us aware that our worries are not necessary. If practiced regularly, this coping skill can pull ourselves away from the grip of negative thoughts and help us feel less stress. Next story Why Are Insecure Overachievers at Risk for Many Health Problems?